Curbing algae growth is one of the key maintenance issues in sustaining aquatic life in a garden pond. Algae forms naturally as a byproduct of water in direct sunlight. Left untreated, the algae may eventually choke off the dissolved oxygen in the water, killing your pond fish. One of the least invasive ways to treat a fish pond without removing fish and draining the water, is to treat with a 3 percent solution of hydrogen peroxide. This is the common concentration of hydrogen peroxide sold in grocery store and pharmacies. 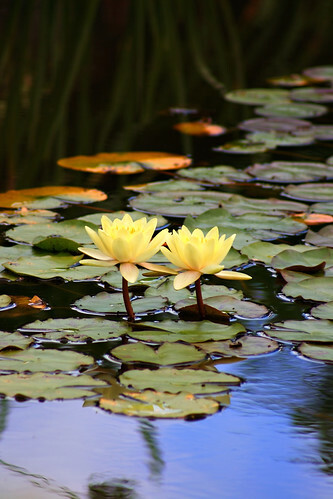 Inhibit algae growth in a garden pond with hydrogen peroxide treatments. Measure the width, length and depth of the pond with a tape measure to calculate approximate water volume. For example, a fish pond might be four feet wide, six feet long and two feet deep. Multiply the three measurements to calculate the cubic feet of water in your pond. For example, 4 x 6 x 2 = 48 cubic feet of water. There are 7.48 gallons in one cubic foot of water, so multiply 7.48 by the total cubic feet in your pond. In this example, 7.48 x 48 = 359.04 gallons of water in the pond. Use one pint of 3 percent hydrogen peroxide for every 1,000 gallons of water. To measure the amount of hydrogen peroxide to use in the current example, divide 359.04 by 1,000 for a result of 0.36 pint. This is slightly more than one-third of a pint. One pint contains 16 fluid ounces, so 0.36 pint equals 5.76 ounces (16 x 0.36 = 5.76). Pour hydrogen peroxide into your measuring cup based on the calculation for your pond size, then pour the solution into the pond. Stir gently with a wooden stick or metal rod to circulate the solution. Remove the dark slime of dead algae from the pond surface with a skimmer the day after treating with hydrogen peroxide.